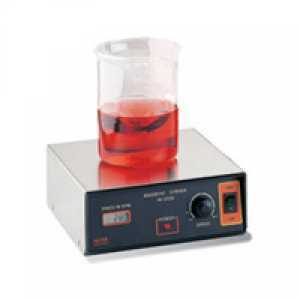 เครื่องกวนสารละลาย HI 303N-2 Two-speed magnetic stirrer with tachometer | Higher Enterprises Co.,Ltd. The departments for quality control and laboratories must be able to repeat exactly the tests. To do this it is necessary that all the data are clear. The factor of speed (rev / min.) Is very important when you shake a solution and to know this data is very important to be able to faithfully repeat tests or processes. HI 303N-2 solves this problem with the speedometer incorporating liquid crystal. This mixer also allows you to work with two separate scales of speed. In each scale the speed can be adjusted to the end to find the desired accuracy. This ensures maximum repeatability of experiments and laboratory processes and production. Besides these features, the agitator is installed inside a speed limiter, which ensures that it never exceeds the maximum level (Speedsafe) . Often, in fact, in the laboratories are removed samples by agitators before even reduce the speed, causing an acceleration of the motor that it leads to breaking. HANNA has inserted in its agitators a system that stops the acceleration of the engine as soon as you removing the sample.